Tradition still rules at Latest Recipe when it comes to the fasting month this year. Chef Budiman Bistari and his team will pull out the stops for Serambi Juadah Warisan Desa, evoking the culinary heritage of Malay villages from different nooks and crannies of the nation for berbuka puasa. Apart from the customary dates to break fast with, a piping hot bowl of spiced Bubur Lambuk Mikerhani should help to restore one’s equilibrium. Aromatic and lightly enriched with coconut cream and spices, the Malay-style congee hit the spot for us. Fresh assorted ulam and kerabu were part of the healthy starters available. Acar, Pecal, Kerabu Mangga, Kerabu Kerang & Betik Muda and Salted Fish Acar from chef’s mom Hajjah Ramlah comprised some of the choice picks to whet the appetite. The hot centrepiece of a buka puasa buffet, whole Roast Lamb will make a comeback too. Marinated with fennel, cumin, coriander seeds, cardamom, cloves, star anise, ginger, lemongrass and other aromatics, few diners could ever resist passing up on this meaty offering. A newer and notable contender I’d recommend highly is Chilli-Garlic Glaze Chicken Drumsticks with Croutons & Lemon Zest. The lush, caramelised flavour from the moist, juicy meat was so palate-pleasing you’d be returning for repeat helpings. Thumbs-up choices also included Kuah Lemak Kepiting Bunga Kantan (crabs in turmeric curry scented with torch ginger), Gulai Lemak Merah (red beef curry), Banana, Yam and Sweet Potato Fritters and Ikan Bakar Air Asam among others. Perennial faves everyone makes a beeline for range from Biryani Hyderabadi and Murtabak, to the expansive Japanese section proffering Teppanyaki Seafood, Tempura, Sashimi and Sushi, and the Chilled Seafood selection. Remember to keep ample tummy space for traditional sweets and modern ones too. Nostalgic bites of Putu Piring, Serawa Durian and Kuihs fought for attention with prettily frosted Cakes, Tartlets, Sliced Fruits, Chocolate Fountains, and Cookies. You’d be hard-pressed to restrain yourself at the overwhelming array. 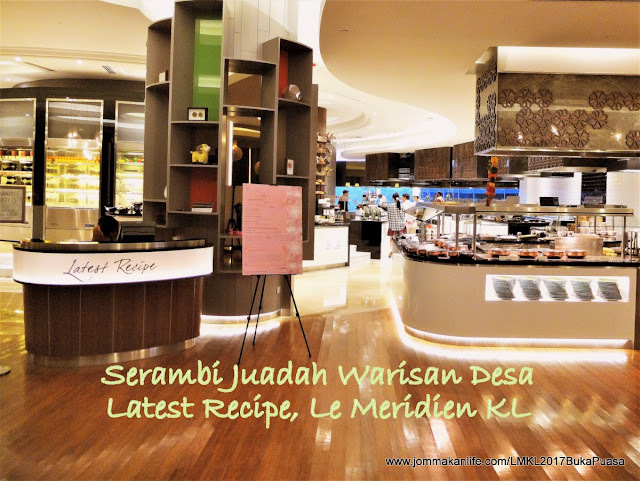 Available from 27 May to 24 June 2017, the Serambi Juadah Warisan Desa buffet dinner is priced at RM180 nett per adult and RM90 nett per child. Early bird vouchers sold now at RM130 nett per adult and RM65 nett per child until 20 May. Complimentary flow of Date Juice, Sirap Bandung, Sugar Cane Juice, Iced Lemon Tea and Teh Tarik inclusive in the buffet.